The full member (1990), corresponding member (1966) of AS USSR, doctor in physics and mathematics (1964), professor (1965). A mathematician, a specialist in the field of probability theory and mathematical statistics. He was born on March 6, 1931, in Moscow. He graduated from mechanico-mathematical faculty (1954) and postgraduate study (1959) in Moscow State University. In the Siberian Branch, as of 1960: a senior research associate, head of a laboratory (1961), of a department (1973), Vice Director (1981-1992), head of the Laboratory of probability theory and mathematical statistics (1992-2003) of the SB AS Institute of Mathematics (nowadays, S.L.Sobolev Institute of Mathematics of SB RAS). Councilor of RAS (as of 2003). A teacher in Novosibirsk State University (NSU) (since 1960), head (since 1965) of the sub-faculty of probability theory and mathematical statistics of NSU mechanico-mathematical faculty that he founded. 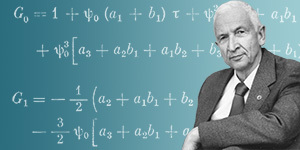 He achieved his basic results in the following fields: limit theorems for random walks and random processes, including the analysis of probabilities of large deviations; ergodicity and stability of random processes; asymptotic methods of mathematical statistics; theory of upkeep systems; Markov processes; boundary problems for random walks. He is the founder and the leader of the Siberian school on probability theory and mathematical statistics. He has solved the problem of asymptotic expansions in boundary problems for random walks. He has suggested an approximate way in studying the convergence of measures and random processes. He has generalized many known theorems about convergence of processes in metric and arbitrary topological spaces, he has obtained unimprovable estimates of the convergence velocity in the central functional limit theorem and in the theorem of behaviour of probabilities at large deviations. General theorems of convergence to Markov diffusion processes have make it possible to develop effective asymptotic methods in studying of upkeep systems. In the field of mathematical statistics, he has constructed asymptotically optimum tests for checking composite hypotheses; he has discovered a conservation law in the theory of hypothesis testing; he has achieved new results in solving the discord problem. He has defined ergodicity conditions close to minimum and the estimates of probabilities at large deviations for many-dimensional Markov chains asymptotically homogeneous in space. Based on this, he has proved theorems of ergodicity and stability for basic types of complicated communication webs and upkeep webs. An outcome from asymptotic analysis of random walks were new integro-local theorems; he completely studied an asymptotics of probabilities of large deviations, including asymptotic expansions in boundary problems for random walks. Of particular importance in A.A.Borovkov's activity is creating manuals that reflect modern state of science. His textbooks «Probability Theory» and «Mathematical Statistics» became the standard ones in the system of national university education; they have been translated to several European languages. He is a member of the International Statistical Institute (1977), a member of executive board of Bernoulli Society (1977). A member of a commission on probability theory and mathematical statistics at the Mathematical Department of RAS. The editor-in-chief of «Matyematichyeskiye trudy (Mathematical transactions)» and «Siberian Advances in Mathematics» magazines. He is the winner of the USSR State Premium (1979), of the Premium in the field of education of the Russian Federation Government (2003), of A.A.Markov's Premium of RAS (2003). He has been awarded by the People Friendship Order (1981), «Honour Badge» Order (1975), and by «the Order of Merit for Country» of the IV Degree (2002). * Source: Borovkov Alyeksandr Alyeksyeyevich // Rossiiskaya akadyemiya nauk. Sibirskoye otdyelyeniye: Pyersonal'nyi sostav / Sost. YE.G.Vodichyev i dr. - Novosibirsk: Nauka, 2007. - S.34-35. Updated: Wed Feb 27 14:46:26 2019. Size: 10,408 bytes.